App of the Week: Gentlemen! While the traditional duel we often think of (a slap of the glove, a demand for satisfaction, pistols at dawn/swords on the morrow, etc.) has long gone out of practice (if it every truly existed that way at all), the fascination surrounding the concept is more prevalent than ever in a time when insults travel the world over at the speed of the internet, and the chances to confront your offender in a mano y mano manner is nonexistent to the point of reducing many to message board retorts delivered under the shroud of anonymity, in the hopes it may provide said satisfaction. They so rarely do, however, which is when the appeal of a one on one confrontation to determine the victor sheds its barbaric imagery, and starts sounding like the practical alternative. “Gentlemen!” is an app that harkens back to those times, while embracing a more modern way of presenting the classic duel. 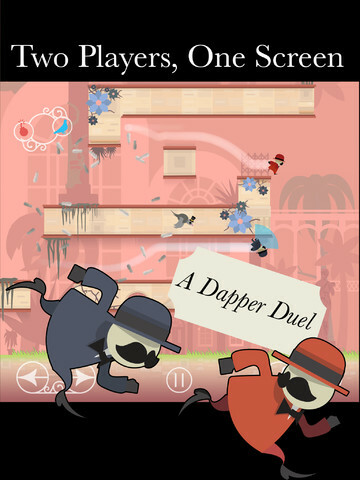 Playing as two cartoon gentlemen (of which we will assume are of Victorian England descent to enhance the image) you and a friend (or “scoundrel” as the case may be) are tasked with each taking one end of a tablet, and controlling your selected gentlemen in his bid to rid the world of his rival through a variety of means. However, that is the point that “Gentlemen!” drops all notions of representing anything even vaguely historic, or practical, and starts having fun. For instance, while said means can include traditional dueling equipment such as knives, the randomly switching weapons are more likely to yield bizarre devices such as explosive homing birds, lightning bolts, or sticks of dynamite. In what I hope is a statement that will help convey the joyful madness often present, matches often resemble animated “Spy v.s. Spy” strips. Said matches also come in three different gameplay types. 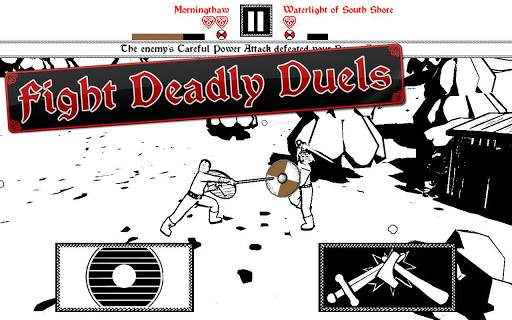 Duel is a straight up one on one fight to the finish with random weapons, while the more intriguing Chasing mode sees one player go unarmed as he tries to escape his opponent, while waiting to receive his turn with the weapon. The third, and unfortunately least appealing, gametype, Diamond, is like Duel, but with the added objective of collecting on screen diamonds. Regardless of the mode, you’ll be able to play it smoothly thanks to simple controls that most including running, jumping, and attacking. The only other button is a gravity switch that makes sense when you consider the different perspectives that each player will view their character at when sharing a tablet. The gravity switch allows you to swap your perspective to match your opponent as needed in order to strike them. While on the subject of the game’s perspective, it must be noted that the game’s biggest weakness is its accessibility. While finding two people, one of which has a compatible tablet and a copy of the game, is not an impossible proposition, it will prevent you from accessing the game as often as you may like, and will straight up deny those without tablet access. However, it’s a positive sign when a game’s greatest weakness is the inability to play it, but that is the case with “Gentlemen!” So long as you can play it, you get to enjoy a frantic and engaging multiplayer experience that never fails to lead to vicarious hoots of victory, shameful admissions of defeat, and fun for all. It’s rare that any game manages to capture everything that made the competitive arcade gaming scene so great without resorting to providing a port of a title from that time, but with poise and pride worthy of its cartoonish leads, “Gentlemen!” does just that. There’s a selfish part of me that wants “Gentlemen!” to remain under the radar, so that the lucky few that stumble across it can feel as if they are in their own secret league of gentlemen (and an extraordinary one at that). However, in an effort to be more like the men of honor that in so many tales competed in the duels that inspired this game, I present you “Gentlemen!,” my app of the week.